If you’re new to art, you might think that drawing is most basic. And, in a way, it is. However, it’s not always the best first choice for a new artist. There are many similarities between drawing and painting. The basics of drawing can be learned in hours, but so can the basics of painting. No matter what subject you’d like to represent — from quick journal sketching, to comics and manga, to realistic representations of your world — you can work with drawing or painting. However, there are separate advantages to drawing and painting, as well. One of the main advantages of drawing is that you can begin immediately with no special art supplies. If you have any paper surface and any writing implement, you can start drawing right this moment. One of the main advantages of painting is that it requires little eye-hand coordination. If you can smear some color onto a surface, you’re painting! In fact, if you “can’t draw a straight line,” you can still paint well. Let’s compare drawing and painting in several areas. Drawing requires something to draw with. That can be any writing implement from a pencil to a pen to a crayon. An eraser can be useful. Some artists use aids such as rulers or compasses, or other drafting tools. You’ll also need a surface to draw on, such as paper. To paint, you’ll need some kind of painting medium such as watercolors, acrylic paints or oil paints. Though some companies try to make the decisions easy by assembling basic student kits, the quality of those paints can sabotage your work from the beginning. The difference between “student grade” acrylic or oil paints and “professional quality” is night and day. With some paints, you’ll also need painting media such as gel medium (for acrylic paints) or linseed oil (for traditional oil paints). You’ll also need brushes. Like paints, the selection can be confusing without guidance from a pro. Cheap brushes can produce disappointing results, but so can the wrong kind of expensive brushes. Finally, you’ll need a surface to paint on. Prestretched canvas boards are convenient if you’re using acrylic or oil paints. 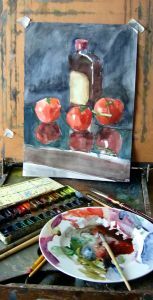 Watercolor artists can use everyday artists’ papers, but if they’re not designed for use with water media, the paper can buckle or absorb the pigment in blotches. In other words, getting started with drawing is simple and it can be very affordable. Choosing supplies for painting can be overwhelming and expensive, but it doesn’t have to be. You’ll find additional guidance at this website. To draw well, you’ll need eye-hand coordination. In other words, your hand — and the pencil or pen in it — should do approximately what you want it to. The more precisely your pencil (or pen) achieves the effect you have in mind, the better. Dyslexia is not usually an issue. If you can use a pencil to write or print, you can use a pencil to draw. However, the learning curve can be steep when you’re learning to draw. It’s normal for an experienced artist to feel frustrated when he or she can’t get the line “just so” in a drawing. 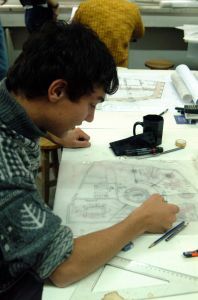 Some simple approaches reduce frustration and help new artists develop their drawing skills. Those include quick sketches, contour drawing, and the willingness to erase often or even throw out a sketch that’s not working at all. At the beginning, simple subjects are easier to capture in a painting. If you’d like something that looks like it came out of a camera… use a camera. You’ll be less disappointed. If you like the appearance of drawing better, learn to draw. If you prefer painting, don’t fall for the idea that artists have to draw before they paint. They don’t. However, before you leap to the conclusion that you prefer either drawing or painting, go to some galleries or museums. Study both drawings and paintings. Analyze which you prefer (if either of them appeal to you more) and exactly why you like them. For example, if you fall in love with Picasso’s paintings from his blue period, remember that the same tone (light and shade) qualities can be captured in drawings. You don’t need to invest in paints for something monochromatic (all one color, with just light & shade differences). If it’s a sense of color that appeals to you, you may achieve that in drawings, too. 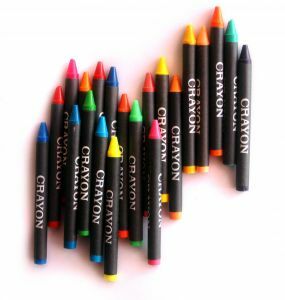 Colored pencils, pastels, and other dry media can convey a similar joyous sense of color. However, if you like bold splashes of color or subtle nuances in color variations, painting may be the shortest route to those effects. If you’d like to create art by drawing or painting, there are good reasons to begin with either one. Drawing requires less investment to start, but greater eye-hand coordination. If your aim is realistic representations (things that look like photographs), that can take years to achieve. Painting involves more supplies and expense, but — with realistic expectations — you can create delightful works right away. The key is to know what appeals to you and why, and choose the medium that will help you create the kind of work that delights you.